In¡HOLA! 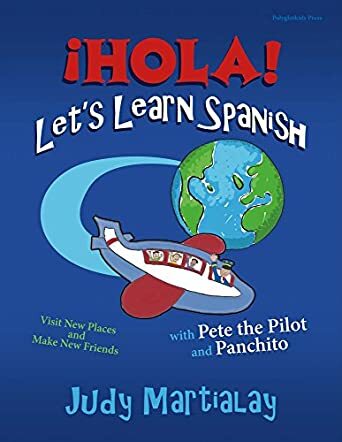 Let's Learn Spanish: Visit New Pages and Make New Friends by Judy Martialay, Pete the Pilot takes kids on a new adventure aboard his magic plane, and this time the destination is Mexico. He has a lot in store for kids. They will learn about Mexico, about the interesting Mexican culture, the children of Mexico and, most importantly, they will learn Spanish. As they follow the exciting story of Panchito the jumping bean and his adventures, kids will have a chance to learn about life in Mexico with helpful tools to help them understand and memorize Spanish words and phrases they will come across throughout the story. ¡HOLA! Let's Learn Spanish: Visit New Pages and Make New Friends by Judy Martialay is a children's language book unlike any other. It is an easy, fun, and exciting way to give kids a head start in Spanish or widen their already existing vocabulary. The book also teaches kids other important social values like making new friends and how to introduce themselves to new people. The style in which the book is written sets the agenda from the very start by using both English and Spanish right from the table of contents. By introducing just a few Spanish words at a time and blending them into the story, Judy Martialay ensures that kids are allowed time to internalize these words without hindering the flow of the story, thereby keeping it fun. The book also includes several useful and exciting tools to help kids memorize, understand, and put into practice the new words and phrases so far learned.